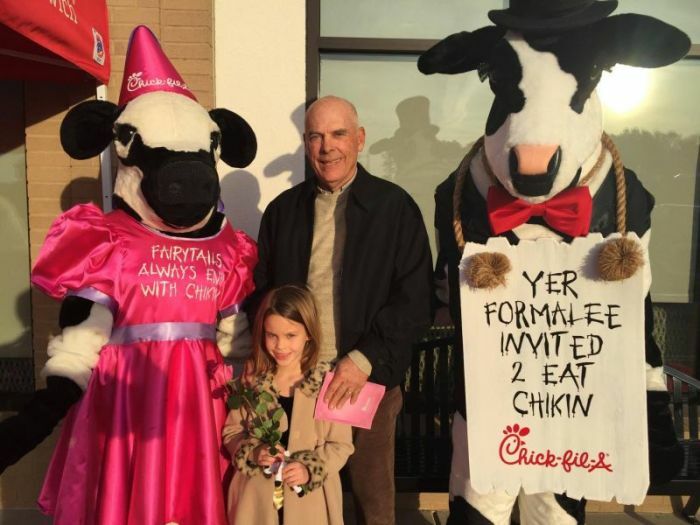 Chick-fil-A's "Daddy-Daughter Date Night" is an annual event hosted by the brand's national chain of restaurants, and has become so popular at one Pennsylvania location that it's being held at one of the area's largest venues. While other Pennsylvania Chick-fil-A restaurants host "Daddy-Daughter Date Nights," the increasing demand for the annual event hosted by a Lower Macungie Township restaurant on Hamilton Boulevard has required a change in venue twice, according to Lehigh Valley Live. The event recently expanded from the restaurant to a Holiday Inn in Fogelsville, which the store's owner, Matt Dempsey, said was more entertaining and offered more activities for attendees. "We started having a lot more fun when we got out of the restaurant," he said. Despite the larger space, which could accommodate 400 people, the event consistently sold out. "Every year we just ran out of room," said Dempsey. "We would sell tickets, and as soon as we started selling them in the store, we constantly had people that we had to turn away." That's when Dempsey began to think even bigger, setting his sights on Allentown's new PPL Center. The Hamilton Boulevard Chick-fil-A's "Daddy-Daughter Date Night" on Feb. 24 will now be hosted on the floor of the PPL Center, which can accommodate 1,000 people. Attendees will enjoy dinner, a DJ, a roaming photographer, a balloon artist, a photo booth and face painting. Chick-fil-A Was Served at the Democratic Convention. You Won't Believe What Happened Next.